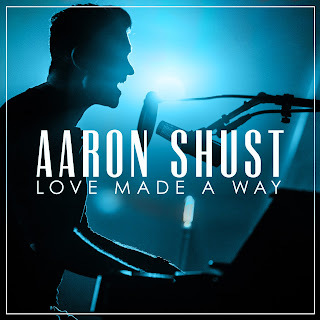 Jay's Musik Blog: An Interview with Aaron Shust + Giveaway [Ended 8/18]! An Interview with Aaron Shust + Giveaway [Ended 8/18]! I am really excited to share with you the first interview I have done since the relaunch of Jay’s Musik Blog! 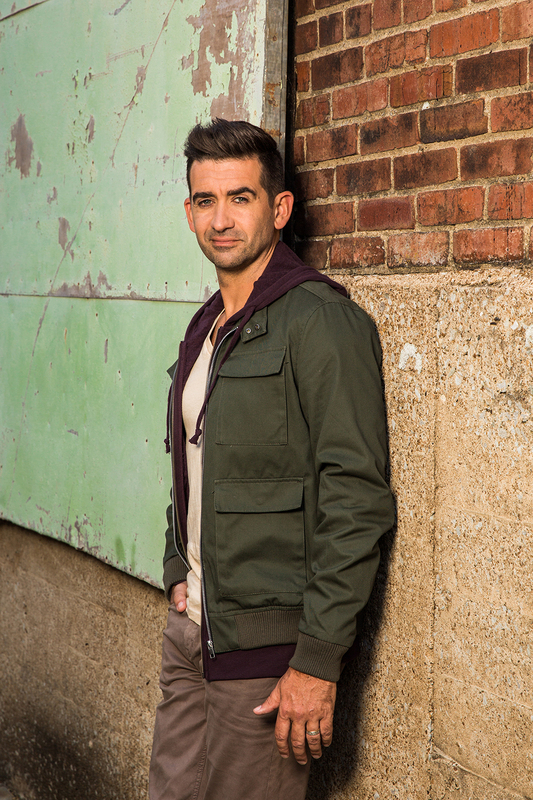 I had the privilege of seeing Aaron Shust in concert last week, and was able to catch up with him before his set. We talked about his new album Love Made a Way, including his favorite songs from the album, and major changes in his life and how he has coped with them. He also gives encouragement to anyone facing storms in their lives. Enjoy this interview, and read on to the end to find out how you can WIN a copy of Love Made a Way [CD giveaway ended 8/18]. Jay: Hi Aaron! How are you doing today? Aaron: I am doing great, my friend, how are you? Jay: I am doing well – I’m excited to see you for the fourth time! Jay: Well, your new CD Love Made a Way released this spring, and it was actually your first live worship album. I’ve seen you three times, and this is going to be my fourth; and I know that you love to lead people in worship. So I was very surprised to find out that you described the process of making this new album as “nerve-wracking.” Can you describe to us why that was? Aaron: There’s something about knowing that you’re being recorded – and like, right here it’s fine, where, you know, I’m talking, it’s just natural, and I’m thinking off the top of my head… even hadn’t planned on saying that sentence. But when things are going to be like stamped on a CD or on a file for as long as CDs and files stay in existence – until the Lord comes back – you know, these things are going to be around. And there’s something about the studio, when you go in and you make it – at least these days, I hope everyone knows – that you manipulate stuff and you go back and say, “You know what we really need? Let’s add a mandolin on top” and go back. But there’s something that’s completely different about doing all the planning ahead of time as opposed to afterward: doing it all ahead of time, getting together, and practicing... we did three days of rehearsal, just back to back to back. And I was having so much fun doing that, I over sang at rehearsal and I kind of lost my voice a little bit; and that was nerve-wracking! My voice was not quite as strong as I would have liked it to be. 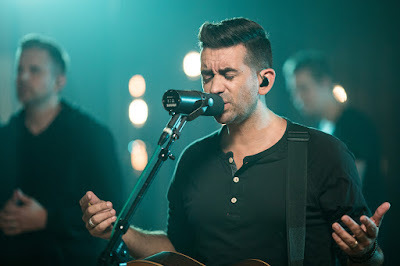 Jay: The first single off Love Made a Way is called “You Redeem,” and if I understand correctly, Matt Hammitt formerly of Sanctus Real actually wrote most of it before he brought it to you during the planning process. Aaron: Yeah! He had written it and brought it to Seth Mosely, and they kind of worked on it together and then shelved it for a few months. And we got together to write and enough stuff came up in conversation and what we were talking about, that he was like, “You know what? I think that redeem song that we started working on might actually be good for you; you might work well to finish writing it.” So we spent two days… you know, we thought we had finished it after one day. It’s cool how people bring things to the table incomplete. We had fun really… fun might not be the right word, but it was actually quite powerful – we being in the studio that day coming to tears singing some of these words of the second verse that we wrote that day: “Lies that were meant to defame will be crushed by the truth that You speak.” That came out of that day. So yeah, but Matt definitely had brought that to the table. Jay: I listen to it often – it’s my favorite song off the CD. Aaron: Cool – playing it tonight for sure! Jay: Awesome – I can’t wait! 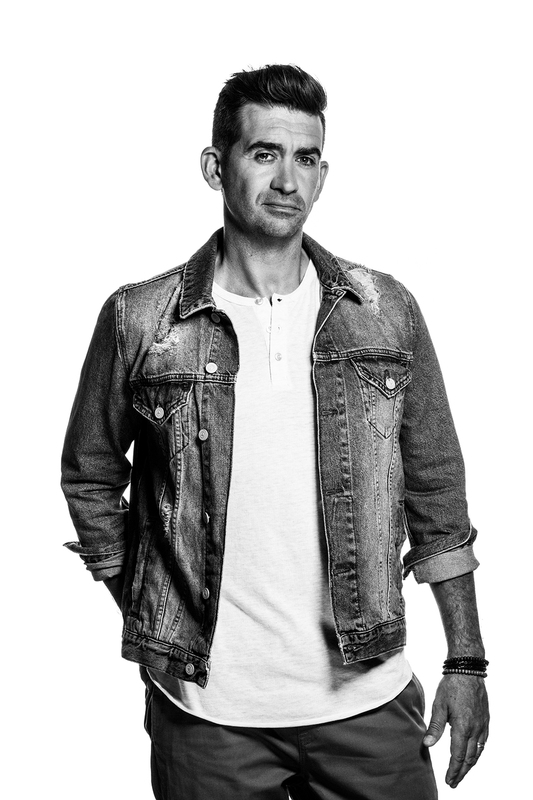 Jay: Besides “You Redeem,” there are three other brand new songs – “Heartbeat,” “Belong,” and “Lead On.” So here’s kind of a fun question for you: which of the three is your favorite, and what is the story behind your favorite of the three? Aaron: “Belong” is definitely my favorite! And I remember the morning that I went to go write that, it was a collaboration lined up – Paul Duncan and Colby Wedgeworth. And just getting ready in the morning, and I started humming the melody of the bridge – that’s not true, the words; the melody came later in the day. I started singing… I think I sang a melody with those words but we ended up scraping that melody and did a new one. But the “take this…” – they’re both from Ezekiel. So Ezekiel 37 talks about the valley of dry bones, that line: “Take this flesh and bones/ breathe Your life again.” In this vision that Ezekiel had, the bones came together and formed bodies in this crazy dream that he was having, but they weren’t alive until God breathed His breath – His Spirit – into them. So that’s just the prayer that God would breathe His Spirit into these dry bones again. And the second half is actually from Ezekiel 36, where God says “I will take Your heart of stone; I will give You a heart of flesh.” It’s a prayer as well. And that’s just a really fun part to sing, especially when its full band and the drums are just going – we can just chant those words. It feels like a really tribal chant, but it’s a prayer. Jay: Cool! And also, you did several covers of powerful worship songs – “Ever Be,” “Cornerstone,” “Death Was Arrested” and “Resurrecting.” So I’d like to ask you: what are some songs or albums by worship groups that you are listening to right now that are ministering to you? That probably changes all the time. Aaron: It really does change often. I listened to Elevation Worship, the new one There Is A Cloud. It was really… in all honesty, I was cutting the grass and it only took me half the album to listen to and I had to go inside. But I absolutely love the temperature of where that lyric was going – I love the prayer that they were lifting up. A unique one, I think, that I’m listening to more of right now: a friend of mine that I just met recently lives on the Sea of Galilee in Israel. His name is Joshua Aaron; and he is Messianic Jew, which means he’s Jewish and he follows Jesus, believes that Jesus is the Son of God; and he sings worship songs to Adonai, to God, to Yeshua; and it’s absolutely beautiful. I’m loving his music. And then he introduced me to a band that I just saw in concert two nights ago, in Nashville. I think it’s called Miqedem. And they sing nothing but the Psalms in the original Hebrew, so it actually rhymes and it has the original meter – chances are – that David etc. intended. When we sing the Psalms in English, it doesn’t rhyme. We make it sound music but they don’t rhyme. But it’s so cool to hear in Hebrew the Psalms as they rhyme and have the rhythm that they were intended to have. The music is super, super fun and high energy. So that’s the whole gamut right there from Elevation Worship to Joshua Aaron to Miqedem. It’s all worship! Jay: So overall, what would you say is the one thing that you want people who listen to your new CD to take away from it? Aaron: That’s a good question. Overall, takeaway… I think it’s the grace of God. It’s interesting as these songs, like you mentioned before, that are covers from worship songs, two of which I’ve been singing for a while (“Ever Be” and “Cornerstone” even longer) that I had previously recorded and wanted to capture the live experience of that… I think the overarching theme that I always come back to is the grace, which just means “the unmerited favor of God,” despite who we are, despite what we do. Our praises… we don’t praise God arbitrarily. We don’t praise God for no reason. We praise God… it’s a sign of, it’s an outward display of, love because He loved us first, and now it’s a response. So it’s recognizing not only the greatness and the strength of God, but part of His greatness is the love that He’s shown toward us whenever we didn’t deserve to be loved. And so I love to sing the songs that praise. Those are my favorite songs to sing, that I’m not just singing about God. I love singing songs where I’m declaring the greatness of God, but I also love to address Him directly, like it says in Psalm 45:1: “I address my verses to the King.” And so that’s the common thread in all of these songs, whether they’re old or new: they’re verses addressed to our King of kings thanking Him for His grace. Jay: So I think this question is along the same lines, but one thing that I personally have noticed about your music and particularly the Doxology album (which I love, by the way) – it seems to me that the more years that you’ve been an artist, the stronger your lyrics have become, or the more pointed toward God, convicted of His Word. And I was wondering, is that something that you’ve intentionally improved, or does that just kind of happen as you’ve grown closer to God? Jay: We talked earlier about how the new album was a very different experience for you, but as you mentioned earlier, you recently moved to Nashville – which obviously entails leaving your family, your friends, your church, your kids’ schools; it’s really a major change. So is change like that something that you as an artist embrace, or is it something that you struggle with, and either way, how do you cope with that? Aaron: This is where the “as you get older” fits in perfectly. As I get older, I am less and less inclined for change; I’m not looking for change. You start to… you talk about the old geezers who are stuck in their ways, and I’m becoming that old geezer who just knows that I love my cheeseburgers with bacon and barbecue sauce. But I’ll tell you this much: there’s always room for some change; there’s always room for some improvement, for experimentation. About two years ago, I started putting a thin layer of peanut butter on the bottom of my cheeseburgers. My family thinks I’m crazy (I guess they do it in Indianapolis) but I think it tastes fantastic. So, now I’m stuck in that way. And this is… the cheeseburger is an example of a bit of growing old and embracing change. I definitely embrace change less. And so I was all good to spend the rest of my days in Pittsburgh, and God definitely tugged on my heart, to myself and my wife, to relocate despite our desire to stay forever in Pennsylvania. And I think He wanted us there for reasons I don’t quite know yet; maybe I’ll never know. But I think God knew -- of course God knew – that we weren’t planning on leaving Pennsylvania; and so He needed to really invade our hearts and our souls and give us an unrest until we were willing to say, “Yeah, we’ll pack our bags and we’ll move.” And then when we did that, He immediately gave us a peace that surpasses understanding. And so yeah – it was a major move; and Michael had 18 specialists (and now 19 with the epilepsy that’s creeped up on him); so we had… I say we… my wife made all the phone calls to transfer all those specialists from Pittsburgh to Nashville, and that’s a lot of work – schools, church, everything. But we’re in the place where God wants us to be, and that makes everything feel right, even though we do miss those relationships that we left behind. Jay: Awesome. I want to close with this question, and I really want to hear your heart in this: You sing “My Hope is in You” every night, in which you sing, “I won’t be shaken by drought or storm.” But you’ve obviously had to go through a lot, especially, as you mentioned, with your youngest two boys having some pretty serious health issues; but you’ve also seen God come through in major ways – like your son’s hearing was completely healed. So what would you say to someone who is reading this interview who is going through a storm, based on what you sing about and what you have learned? 62:5: “Yes my soul, find rest in God; my hope comes from Him; truly, He is my rock and my salvation, my hope, I will not be shaken.” And so, what I love about that is it’s not my strength. I love that David says “because of God’s strength” – because God is my strength, because God is my safe place, because God is my fortress, He’s my shield; because God is those things. Because of His great strength, I can firmly say, “I will not be shaken,” as opposed to, “It’s my strength.” ‘Cause if we try to rely on our strength, we’re gonna be shaken. So I remember thinking, you know, “David, man, that’s kind of unrealistic to say ‘I won’t be shaken.’ I mean, get in touch with reality, man, of course you’re gonna be shaken!” But he’s saying, “No, I’m not shaken!” I might be in the middle of the storm… the boat might be rocking, but I know I’m secure because Jesus is in the boat, and He said we’re gonna go to the other side. Now I’m using an analogy from the New Testament. Jesus said, “Get in the boat, we’re going to the other side.” The storm whipped up and the disciples were beside themselves with fear; and Jesus said, “Why do you have such little faith?” It wasn’t an arbitrary faith, to use that word again; He was saying, “I told you we’re gonna get to the other side… we’ll get you there, don’t worry about it!” And He’s told us the same thing, too: He’s gonna be with us, He’s never gonna leave us, never gonna forsake us; that we don’t need to fear in the middle of the storm; He’s gonna get us through. So it’s through His strength that we won’t be shaken. Jay: Well thank you again so much for your time. I look forward to seeing you out there! Aaron: You’re so welcome! Thank you! Enter to win a copy of Love Made a Way! See the box below for instructions on how to enter. Have fun!! [Giveaway ends 8/18/17] Giveaway only open to residents of the USA. I loved his response to the last question concerning what he would say to someone who is in the midst of a storm. My favorite is the one about him moving to Nashville. He answered it with so much wisdom. I'd love to win. I've been your blog's follower since the beginning. You inspire me a lot, Jay. Kudos to you and your blog. I appreciated your note about his lyrics. I have also noticed, since This is What We Believe, that he seems more convinced of the truths he is setting forth in his songs. A mark of a good worship leader. What an excellent interview! Great questions and great answers. I love how authentic Aaron is. His love for God shines through his words and music.